Mother Lovett is a hoot! Those peach cookies look fantastic! Cookie heaven <3 they look so cute and yummy! That looks amazing. I love those little pastel colored mints. Lol! This post cracked me up. Mother Lovett reminds me so much of my own Grandma who has been known to fondle the baked goods unbeknownst to other guests at dinner parties. She’s a sneaky one, that Grandma of mine. I have been to a wedding with a dessert room and it was fab. I hope to have the same some day. I’ve seen this before, but never been to a wedding with one!! I’m absolutely having one at my wedding. Mother Lovett is adorable…she’s so tiny, it reminds me of my own grandmother! Oh my! This is pure genius. I thought about having a cookie bar at my upcoming wedding, but I think I and my guests would much rather enjoy and entire room full of them. Gorgeous stuff there. Did you and your family bake them all yourselves? Or is this a silly question? Not a silly questions at all! I didn’t make any, and I’m pretty sure my immediate family (aunts, grandmas, mom, etc) didn’t make any. However, we did have a lot of wonderful family friends make the majority of them. I also had a client make some – her cookies were to die for, There were a few dozen we ordered from a baker, simply because it was the only place we could find certain cookies. I can only DREAM of how delish that room smelled! I have heard of this once, I think… and many different people make the cookies, right? Dessert rooms are mandatory. My family is from Europe, and all of the weddings/showers/christenings, etc. we have consist of long sweet tables. We even make those peach cookies! My granny makes them :) I need to work on a recipe and a blog, and will message you when I get it! In the meantime, they are two cookies held together with apricot jam, cream, etc, and the cookie can be rolled in sugar. I’M VERY JEALOUS RIGHT NOW AND WANT TO HAVE MY WEDDING IN PITTSBURGH. Holy crap! That’s a huge amount of cookies! We didn’t do cookies at our wedding but my sister did and I felt like those lasted forever but it wasn’t this big of a room full of them! Why did I not have one of those at my wedding?? Amazing! Ohmygosh, I want you to be my best friend. I’ve never heard of a cookie room at a wedding, but it honestly looks like heaven. I wish I would have known about this sort of thing when I got married!! Heck, maybe I’ll have a party and just have a “cookie room” in our guest bedroom or something. 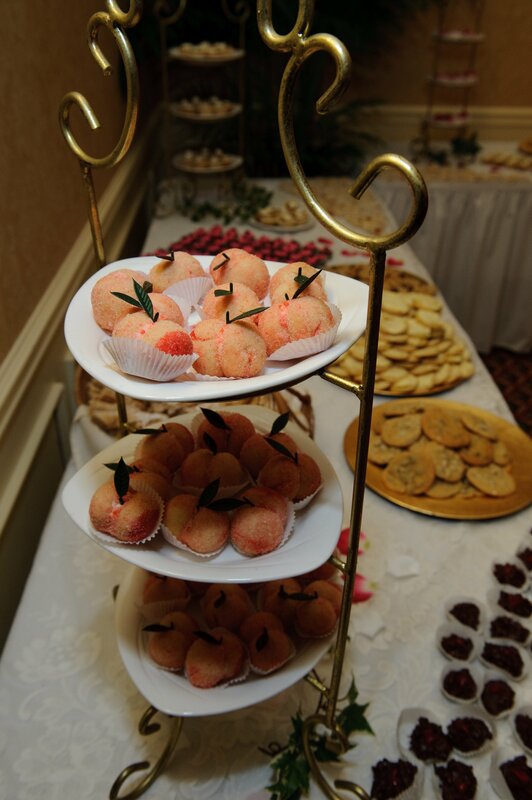 Most Italian weddings here in Cleveland do the cookie table – I know I did! Oh man, I think I would have left a very happy girl if I was in that room! I have heard of this tradition and I think it’s PURE GENIUS! I’ve never seen so many amazing sweets in one place! We totally had a HUGE cookie table! I grew up in the Hollidaysburg/Altoona area (where the wedding took place too) and all of my husband’s family from Ohio didn’t know what was going on! Totally a tradition for Pennsylvania! My cookie table was quite special. I lived at home with my mom the whole month prior to our wedding and started working on baking and freezing cookies right away. Sooo I actually made most of the cookies myself! My mom helped and my Grammy made some too. My MIL also brought some along! Girdle!! haha My grandma still swears by hers. Too funny!! I love love love that you had a cookie room. Amazing! I’ve never heard of a cookie room at a wedding, but I’m loving the idea. Give me a cookie (well maybe several) over cake any day. I think a cookie room is BRILLIANT!! My grandma said that it is definitely a Pittsburgh thing!! :) But I think the idea should catch on down here!! What a wonderful idea!!! When Keith and I were engaged we had a “drinks and desserts” coupe’s shower. It started at 8:00p.m and we had TONS of desserts and lots of drinks! It was a really fun night. I have also been to a wedding that started at 9:00p.m. 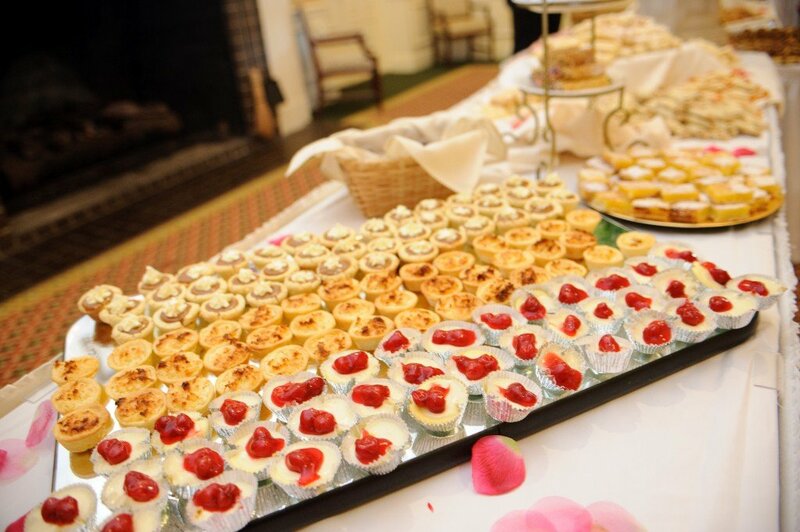 and all they had for the reception was TONS and TONS of desserts…that was one of my favorite weddings! haha! I love the cookie room!! Your wedding cake was ridiculous. So beautiful. I suppose the cookie table is a Pittsburgh thing, but my friend got married in Baltimore in 2008 and they had a cake (made by Duff of Ace of Cakes–it was delish! ), plus cookies–some made by the bride’s family, and some by the groom’s. I think it’s a fabulous idea. I personally want to serve cupcakes at my wedding!! I want a cookie room in my house! I’m pretty sure this is what heaven looks like!!! Mother L and my grandma were twins! About 4’10” and hunchback AND totally into baked goods and cookies. My grandma could bake bake bake. Til her deathbed, she walked 1 mile to mass every morning at 7am AND baked cookies. she was literally and legally blind, cooked by feel. No measuring cups, nothing written down. It all died w/ her. My mom tries some stuff but it’s not like grandma’s was. I have been trying to convince my sister to do a cookie table – I think it is the BEST idea!! Mother Lovett sounds like a character right out of a movie. Once your book is published – it WILL be made into a movie. I am predicting that now. You are hilarious, and so is Mother Lovett. Aww this reminds me of my grandfather (who also had a HUGE sweet tooth and was also from PA). At our wedding we had cupcakes trees as centerpieces loaded with a few different kinds of cupcakes. When I went to the table that my parents and grandparents were seated at I saw an empty hole on the cupcake tree. My grandfather had taken one and eaten it before dinner! Yay for creative wedding ideas! Ok I definitely need to get to a wedding with a dessert room! I have never heard of this before, but what a great idea! And here I thought the cake was amazing, and then you drop this cookie room bomb—oh yum! it must be a PA thing, because the only wedding I’ve been to with cake and a cookie bar was my best friends in Berwick, PA. love the photos! Now you know how to throw a wedding. A cookie/dessert room. I could do some damage there. Is this heaven???? Looks like heaven to me!!!!! WHOA COOKIE HEAVEN!!!! this all looks amazing!!! My family is from Western PA and yes, this is a common tradition there!